This extremely well researched recording is captivating. Based on repertoire performed by Marie Fel, the ‘Jenny Lind’ of the court of Louis XV, it ranges from the restrained elegance of de Lalande to the Italianate excitement of Mondonville. Coming to the French capital in 1734, Fel was lead soprano in the Paris Opéra—often creating principal roles in operas by Rameau—while also taking major roles in the Concerts Spirituels. 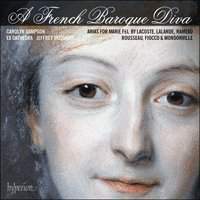 In a time of musical change, she would have sung in many different styles, from the Lullian traditional right through to the Italian-influenced music of the 1730s and later. In standing in for Fel, Carolyn Sampson is quite remarkable. She has the capacity to soften the vocal line with carefully controlled vibrato, but also deploys tone of crystalline clarity. There are many highlights, but the characteristically colourful excerpt from Mondonville's Daphnis et Alcimadure is particularly delightful as is Rameau’s La lyre enchantée. Throughout, Jeffrey Skidmore and the orchestra offer dependable support as does the choir, but, notwithstanding the slightly overambient acoustic, what shines out is Sampson’s singing: bright, vibrant, responsive and entirely in tune with the expressive language and virtuosic demands of the period.